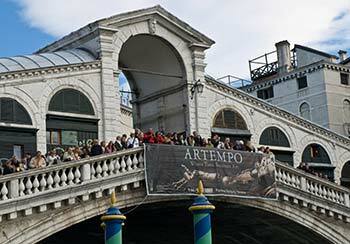 ABOVE: Tourists watch canal traffic from the Rialto Bridge. The Ponte di Rialto, a.k.a. the Rialto Bridge, has been the main pedestrian crossing between the two banks of the Grand Canal since 1591. In fact, it was the only bridge across the Canal Grande until a predecessor to today's Accademia Bridge was built in 1854. You might think that, with Venice being a city of traders, the shopping arcade in the center was built to separate tourists and locals from their money. In fact, the shops have a structural purpose: The rows of covered arches that run up the center of the bridge and over the top help to stiffen the bridge, making piers unnecessary and allowing 7.5 meters or 24 feet of clearance for boats (including the galleys that existed in the 16th Century, when the current stone bridge was built).